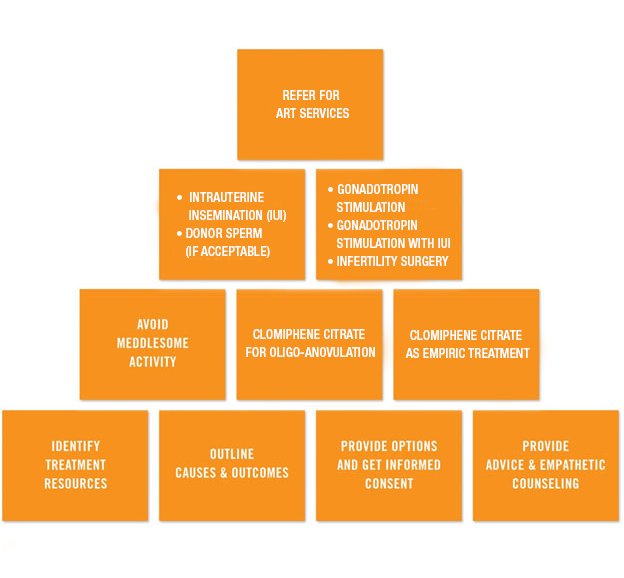 The treatment tool describes care at three levels: from lowest resources and cost at the bottom of the pyramid to highest resources and cost at the top. The lowest level health care setting might be a primary health centre (PHC) run by a midwife and/or staff nurse as Primary Care Provider (PCP) or Health Provider (HP). The major activity at this level is to provide advice and counselling. Identify treatment resources: Does the PCP or health provider (HP) have sufficient knowledge of fertility and infertility? Treatment choices are limited at the primary level, but fortunately infertile couples may get pregnant without treatment. However, many couples have a poor prognosis and others may not want to wait. Thus the HP must determine what resources are available. Outline causes and outcomes: The PCP should outline the causes of the infertility based on history, physical examination and available diagnostic tests. Available treatment resources should be explained to the patient together with potential outcomes, which should be quantified where possible. Provide options and get informed consent: The PCP should list the appropriate and available options. The benefits, costs and risks of each option should be described and questions answered. The patient and provider should then choose the best option, and the provider should obtain informed consent for treatment. Provide advice and empathetic counselling: The PCP should provide comprehensive supportive counselling for infertility, taking into account medical, cultural and socioeconomic issues. Ongoing advice and counselling should continue as treatment progresses. Intermediate services represent a wide range of health care levels between Primary Care and the most advanced levels. Avoid meddlesome activity: Meddlesome activities include strict coital timing, use of calendars and basal temperature recordings, none of which have been proven to increase the probability of pregnancy. Other meddlesome activities include unsubstantiated limitations or interventions on diet and medications, exercise or other activities that have not been shown to increase pregnancy rates. These may cause disruption, cost and stress in the patient’s life. Clomiphene citrate for oligo-anovulation: Clomiphene citrate is an effective treatment for oligo-ovulation and anovulation. It helps to cause regular ovulation and increases pregnancy rates. It should be used only in properly selected patients and for not more than 6 treatment cycles. Letrozole has been shown to be superior to clomiphene for patients with polycystic ovarian syndrome (PCOS). Clomiphene citrate as empiric treatment: Clomiphene citrate is frequently used empirically in ovulating women to stimulate the development of more than one follicle in the hope it will increase pregnancy rates. Its value in most infertile couples remains unproven. Advanced services other than ART involve a tertiary centre with diagnostic and therapeutic facilities such as in a referral hospital in developed countries. The relevant services for infertile couples include intrauterine insemination (IUI), use of donor sperm if available and acceptable to the patient and society, gonadotropin treatment and infertility surgery. (a) Intrauterine Insemination (IUI): IUI can be used with controlled ovarian stimulation. IUI without COS is of limited value unless there are barriers to sperm deposition such as male erectile dysfunction (ED) or male or female anatomic/physiologic/psychological problems. IUI can also be helpful with cryopreserved/thawed sperm. (b) Donor sperm: donor sperm can be used when available, appropriate and consistent with patient and society values and laws. (a) Gonadotropin stimulation with IUI: ovarian stimulation with IUI can be used for oligo-anovulation after clomiphene/letrozole treatment failure and limited empiric FSH/IUI treatment where IVF is not available. (b) Gonadotropin stimulation: ovulation induction can be used for oligo-anovulation after clomiphene/letrozole treatment failure and limited empiric Follicle-Stimulating Hormone (FSH) treatment where IVF is not available. (c) Infertility surgery: tubal surgery and/or surgery for fibroids, adhesions and endometriosis are sometimes indicated. In highly selected patients, laparoscopic ovarian drilling may be used for polycystic ovarian syndrome (PCOS). Hysteroscopic surgery may be indicated for polyps, myomas, intrauterine adhesions, cornual obstruction and uterine abnormalities such as septum. It is important to treat co-existing endocrine conditions and other female and male infertility problems. ART services: If IVF is accessible it should be used as indicated. ICSI can be used selectively to treat male factor infertility. Preimplantation genetic diagnosis may be used in selected patients with genetically-based medical conditions. The value and role of preimplantation genetic screening (PGS) for aneuploidy has not yet been proven. Adopt protocols to avoid ovarian hyperstimulation syndrome (OHSS) and multiple births. Blastocyst culture may have some applications. The use of donor gametes and embryos, and surrogates/gestational carriers in ART can be selectively used when available, appropriate and consistent with patient and society values and laws.